I had a new commenter today, Alison who blogs at House, Chickens, Eggs & Cakes. As I scrolled back through a few of her posts to see what she gets up to, I noticed a post from about 10 days ago where she said that Monty Don on Gardener’s World was cutting all the leaves from his tomato plants to direct the energy into ripening the last of the fruits. I still have a lot of green tomatoes on my plants so this afternoon I have been cutting all the leaves off. I only had one mishap and cut the wrong bit, so I now have a small bunch of green tomatoes in with my bananas. The whole thing is leaning rather precariously! 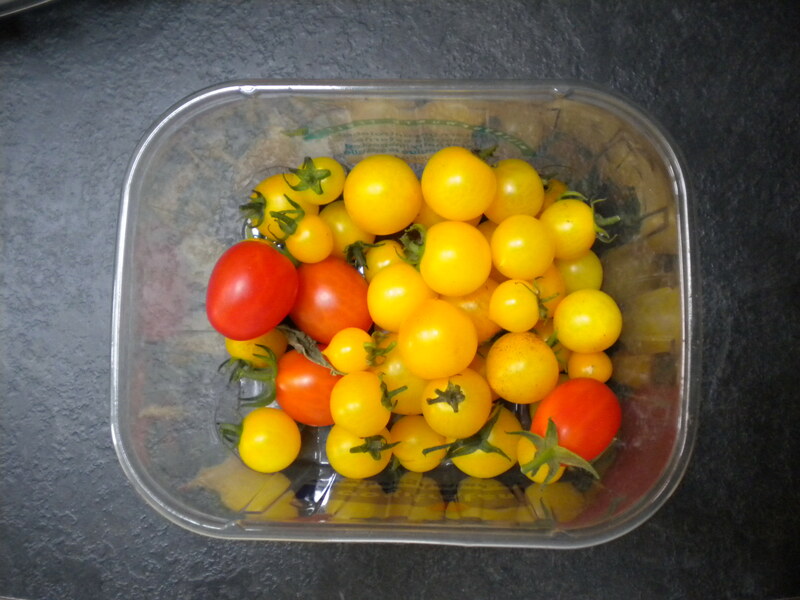 The red tomatoes belong to two plants, one is a Gardener’s Delight and the other is supposedly a Sweet Millions, but I have my doubts about that because the pictures I’ve seen of SM are round cherry tomatoes, whereas mine are more of a plum tomato. It’s possible the labels got mixed up when I bought the plants. At the very bottom of the picture you can just see my yellow tumbler which also still has loads of toms on it. I picked this lot before I did the tidying….. 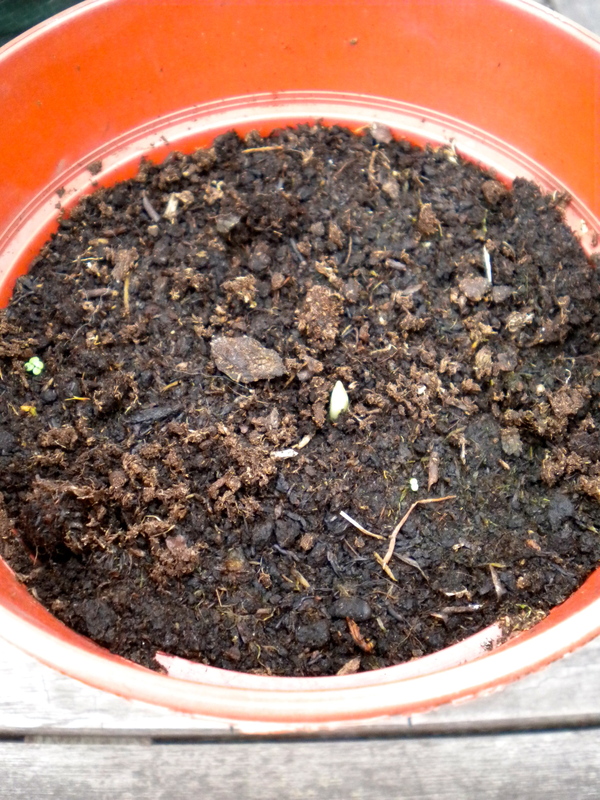 Exactly two weeks ago I planted a supermarket clove of garlic in a pot, and look what I found today…. The dog was allowed back into the garden this weekend and has peed on the lawn, and walked all over the borders! Not the veg patch though because we have put up some trellis all the way round it just high enough for me to step over. She could jump it if she really wanted to but hopefully she won’t work that out! It’s always nice to have new people commenting, and then looking at their blogs! 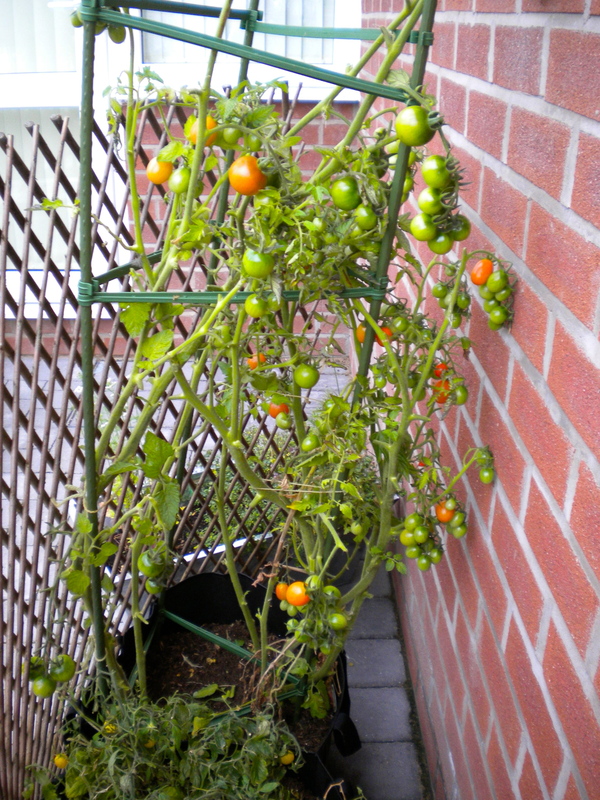 Removing leaves like that is a good idea and should result in some more ripe tomatoes. I like the look of those yellow ones. I grew some last year which were very tasty, didn’t this year but will next year. Considering everyone else seems to be suffering with blight you are doing very well with your tomatoes. Still plenty to come.